Yesterday, Dodge came clean regarding the badly-kept secret that is the Charger SRT Hellcat. The details have been covered heavily by just about every media outlet at this point, but a vehicle this extraordinary deserves one more recap: 707 horsepower. 11-second quarter mile on street tires. $60,000 price of admission. To top it all off, it's gorgeous in menacing, psychopathic sort of way. Seriously, have a look at the media gallery. I think all performance cars henceforth need a white paint/bronze wheel option. There is literally nothing on the market that even comes close, at any price point, and there never has been before, either. Do I want one? Oh yes, I do. Very badly. I need to start there, lest I sound like one more internet troll in the paragraphs that follow. I've mentioned before that when it comes to my automotive loyalties, the company that Walter P. Chrysler built stands highest. My grandfather drove Dodges almost exclusively. My father is a dyed-in-the-wool Pontiac man, but every car he's owned that wasn't a Pontiac has been from the Chrysler stable, save one brief lapse of judgment forever known in our family as the "Stinkin' Lincoln". Ten years ago, I was in college, flush with cash from my 12-dollar-an-hour internship, and looking to replace my venerable Oldsmobile, which had developed a disturbing habit of suddenly turning off while driving down the highway. I test-drove a few (not gently) used BMWs and an Acura RSX before I read an article in the back of Car and Driver about a little turbo Dodge that could shame a Nissan 350Z for under $20,000: the SRT-4. Back then, SRT only made three vehicles: the Viper, the SRT-4 and the Ram SRT-10. The LX platform was just starting to make the auto show circuit in the form of the Dodge Magnum and Chrysler 300. If a HEMI© was available at all, it was only in a truck. The Ford Mustang wouldn't go "retro" for another year. GM had killed the F-body twins a few years earlier, and was doing its best to make sure the new GTO snatched defeat from the jaws of victory. The SRT-4 was a factory hot rod in the purest sense, an economy car shell with the best bits the company skunkworks could find in the corporate parts bin. It had a turbocharged, intercooled engine making 230 horsepower mated to a transmission from Chrysler's Mexican small trucks. The exhaust was a factory installed straight pipe. The turbo meant torque came on low in the rpm range like an old big-block. Driving it didn't feel so much like operating a machine as being saddled to a wild animal. It was still an economy car by birth, though, and the cost cutting verged on comical. The interior was mostly hard, black plastic. It had power windows, but only in the front - the rears were crank. Best of all, only the driver's sun visor had a cover over the mirror. There were exactly three options: side airbags, a sunroof, and an upgraded stereo with an amp and subwoofer, because it was the early 2000s. I could barely drive my SRT-4 when I bought it - it was my first car with a stick - but I learned quickly, and put 1,000 miles on it in the first weekend. It soon became obvious that I had something out of the ordinary. Other owners would talk to me in parking lots. A couple of classmates invited me to join a car club, which mostly involved hanging out in basements and talking about what we would do to our cars if any of us had money. When I visited my girlfriend's sorority house, I heard other girls' boyfriends talking in hushed tones about the SRT in the parking lot. No joke. 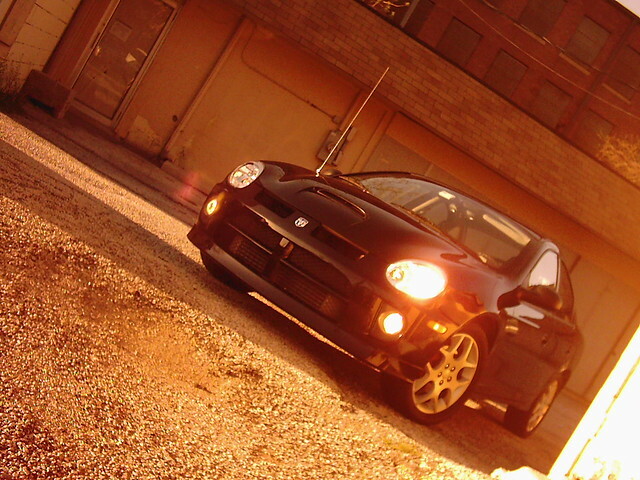 Despite my affluence relative to most college students, the SRT-4 was my only car for many years, and in that it excelled. Despite its performance, and the temptation to abuse said, I regularly saw 30+ MPG. I swapped on a set of snow tires after the first winter, but thanks to light weight and a limited-slip diff it's never, ever gotten stuck. It even got me to work through a low-grade hurricane, once. Being a four-door sedan, it can carry five people with ease. Unlike the poor dads in so many car commercials, forced to trade in their sports cars to accommodate a family lifestyle, the SRT-4 works as a family car just as well. Alternately, the fold-down back seat has allowed me to move an apartment's worth of junk across the country more than once. That much-maligned black plastic interior? Wears like iron. Smear a little Armor-All and it looks like new, which is admittedly more than I can say for the paint, which scratches if you give it a sharp look. I never thrashed it especially hard, but the notorious Neon reliability has proven a myth: in ten years I've probably spent less than $500 on actual repairs, and its simple enough I've done most of the work myself. What I'm saying is, SRT made a lifelong customer of me by reaching me when I was young. They gave me a roughshod, over-boosted economy car in my budget that could humiliate many more sophisticated machines, while still providing enough day-to-day practicality to make for viable transportation. Standing in your little room. You're gonna need a bigger room. You might not know what to do. Standing in you little room. The Charger Hellcat is a devastating doomsday machine, for sure. Maybe I'll own one someday. That would be nice. But that's just the problem, "someday". It's a "someday" car. It's a car for the baby-boomers already among the devoted faithful. Sure, the college kids of today may lust after it, but they can't afford it. (Even if they can, I bet they can't insure it.) So, they'll find their way into a Subaru WRX, or a Ford Focus ST, or a Honda Civic Si, or a Volkswagen Golf GTI, and that's where loyalty will take root. The Hellcat is Barrett-Jackson, but we need more Craigslist. I'm not suggesting the Hellcat shouldn't be built. It's ludicrous in much the same spirit as the original SRT models, and as an SRT fan, I love that it's "one of ours". I'm just saying that the SRT brand needs to grab the attention of the next generation if they want to thrive. Maybe then they'll finally put down their smartphones.